Kung Fu Yoga assaults both senses and soul, warns Sukanya Verma. I am wary of Indo-China oddities that go by the name of Schezwan Dosa or Chinese Bhel. They never turn out to be any good. Ditto for Stanley Tong’s Kung Fu Yoga. It follows the same shallow formula of gimmicky food except it’s neither cheesy enough to amuse nor zestful enough to engross. The only reason this baloney, which makes a board game of snakes and ladders look more challenging than a cross-border treasure hunt, merits any attention is its star and saving grace -- Jackie Chan. But at 60-something, the kung fu star is hardly the spry swinging, springing, somersaulting, closest thing to a live-action cartoon he once was. And Tong’s daft creation does little to disguise those limitations or focus on Chan’s much-loved goofy traits. Instead, its wannabe Indiana Jones premise casts him as an archaeology professor journeying across picturesque locales of freezing Tibet, posh Dubai and regal Rajasthan. He leads a hunt for lost fortune using a team of deadpan nitwits (including Disha Patani and Amyra Dastur) and props like an ancient map that resembles a leftover, stale thepla and a 212-karat pink diamond. It's the sort of low-grade stuff that passes off as rare gems in B-grade Bollywood costume fantasies. For subtext, a tacky animated prologue garbles something about an ancient battle between Indo-Chinese warriors and its link to the forgotten riches of Magadha Empire. If the choppy editing and abrupt jumping of scenarios isn’t disorienting enough, the English dialogues hurt to hear. They’re so shabbily written and dubbed (Duhnt-movh). It’s like experiencing a conference of Internet bots using Google translation. At one point, Sonu Sood, Kung Fu Yoga’s prime antagonist, producer and preserver of two stock expressions -- scowl and sneer -- instructs his minion to ‘Check her out.’ It gets even more ridiculous when Mandarin-speaking characters converse in dubbed English but the English-comprehending characters still have to pretend they don’t understand because the makers neglect to make sense. Then again, logic is an expendable concept in Kung Fu Yoga. What exists in abundance is lousy acting and lousier CGI devoted to create pointless, phony imagery of spiritless wildlife. So wolves are shooed with snowballs. Lions take passive participation in luxury care chases. Snakes hiss and slither as if their identity was in question. And a hungry pack of hyenas don’t have the last laugh. 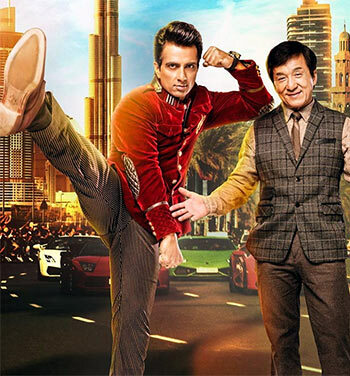 Kung Fu Yoga further embarrasses itself by assuming there’s still an audience for India as a country of attention-seeking snakes, rope tricks mid-air suspended sadhus and royalty that looks straight out of a garishly-dressed mannequin off S V Road. Worn down by shabby aesthetics and absurd mumbo jumbo, Kung Fu Yoga assaults both senses and soul. Not a combination you want to try.